The QiScan Software developed by us is able to digitalize books or magazines via two high resolution NIKON or CANON digital cameras plugged to a normal PC. Every 4 to 7 seconds two high resolution pictures of both opposite sites are taken. 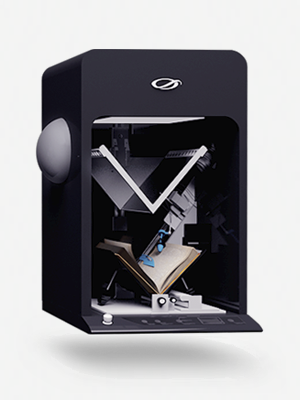 With the Qidenus scan-robots the page-turns is done either manuelly or also fully automated. Qidenus – www.qidenus.com – whose scan-robots we developed this software for, is an austrian startup company which distributes it’s solutions world wide. Qidenus scan-robots are operated at many famous institutions and are used to digitalize huge amounts of partially very old and valuable books and documents. Usage of standard hardware: PC’s as well as high resolution NIKON and CANON reflex digital cameras are the base for high-quality (book-)scanners. Every 4 to 7 seconds (depends on the camera, resolution and data format) 2 images (RAW, TIFF, JPEG) are taken and passed to the PC. Background batch-processing of the jobs (conversion, image-processing, OCR, export) on the same or on remote batch-computers.